In 2016 and beyond, IT buyers looking into virtual client computing (VCC) software suppliers not only have to consider their company’s current needs but also what they will need to accomplish digital transformation (DX). There is no doubt that client virtualization technology can play a key role in the unified device management, which can enable an IT organization to focus more of its energy into strategic DX endeavors as opposed to being consumed by managing PCs, users, applications, and devices. IDC believes that end-user experience is the ultimate arbiter of the success or failure of VCC implementations. 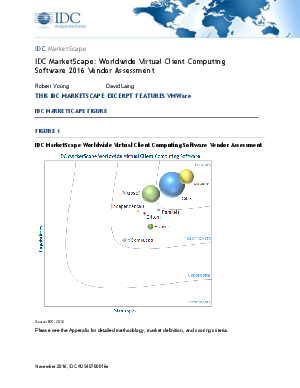 This vendor assessment explores VMware’s strengths and IDC MarketScape's methodology for naming VMware Horizon a leader for two consecutive years in client computing software and virtualization.